For lower income couples in Bangladesh, marriage is complicated by a whole host of additional challenges. For starters, most village women are not allowed to make money or work outside the home. In extreme cases, they are not allowed to leave the house without their husbands. This is problematic for many reasons, not the least of which is the financial strain it puts on the family. It’s difficult for a man to earn enough to feed, clothe, and house his family, not to mention pay for medical care and his children’s education. The financial stress puts a significant strain on the marriage, sometimes leading to abuse. Because most children in these communities don’t go to school after the age of 12 or 13, most of the population is illiterate. Young teenage boys begin child labour to help support the family, and young girls are forced into child marriage. Families tend to stick to themselves and family disputes don’t leave the home - no sense in airing your dirty laundry. This puts an immense amount of pressure on the marriage. Sohorab and Dulena were one such struggling couple. They were poor and had no savings. Sohorab worked as a mason and Dulena was constrained to being a housewife. Just to bear the day-to-day expenses of his family, Sohorab borrowed money from a local lender, who turned out to be a loan shark. Consumed with their own desperation, fear, and isolation, Sohorab and Dulena struggled to care for their children. They kept to themselves and didn’t have a good relationship with the neighbours. What ended up saving their marriage (and family) was a full-scale reorientation of their values, combined with economic opportunities for Dulena, community support for Sohorab, and education for their children. Food for the Hungry (FH) staff living and working with the people of Char Borobila began introducing new values that equipped the community to start to solve their own problems. These values are rooted in the Christian belief that every individual is created by God and blessed by God, so that every individual is infused with unique potential by their Creator. This begins a movement from inward focused to other-focused; God calls us each to love, serve, and protect our neighbours, our children, and yes, even our spouses. By participating in various development trainings conducted by FH staff, Sohorab and Dulena began to catch a new vision for themselves and their marriage. They attended a couples’ workshop together that was instrumental in transforming their home from a place of fear and stress into a haven of peace and happiness. It revolutionized their marriage and their approach to parenting. All of their children are now in school. Their financial stress also began to be alleviated by joining a Savings and Loans group and planning for their future. 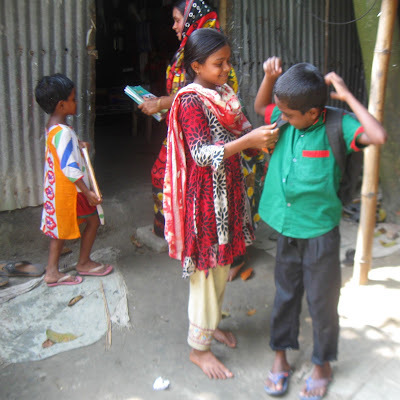 Gaining access to basic health education and learning about their rights under Bangladeshi law has also improved their family life. As Sohorab and Dulena become increasingly involved in their community, the suffocating isolation they both experienced is lifting. According to their own testimony, they can now identify their problems and work together on solving them. The transformation of their marriage didn't arise out of any one thing - I'm sorry to say, there's no silver bullet for any of us. And while poverty definitely contributed to their "stuckness," the root of their change seemed to grow out of a genuine transformation in worldview. Sohorab and Dulena began to see the intrinsic value in themselves and each other. How many of our own broken marriages arise from a similar bitter root - a deep misunderstanding of who we are, and who our partner is? How many of our broken marriages are a result of misplaced values that allow difficult circumstances to crush all hope of happiness? How many of our broken marriages are fractured by isolation from other couples and families? Marriage is hard. But maybe not impossible. Even though everything isn't roses for Shorab and Dulena, they are beating the statistics.